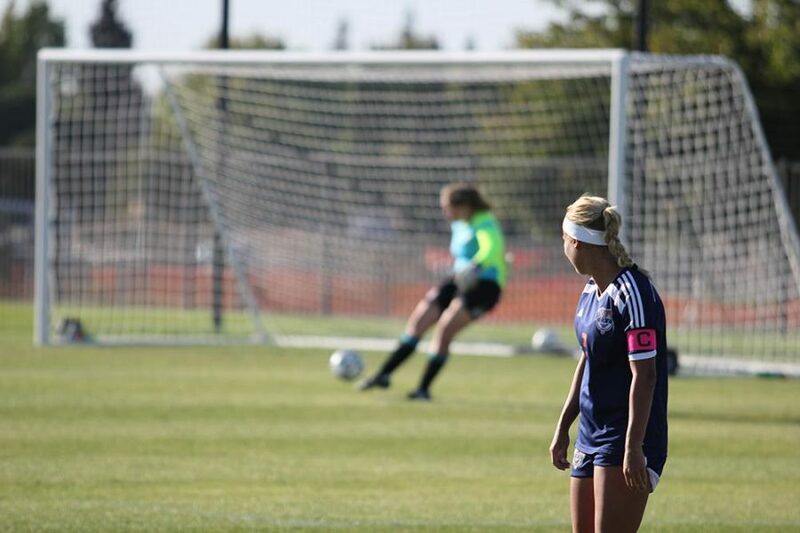 Sophomore defender Kori Martin catches her breath as goalkeeper Anna Brown keeps Evergreen Valley College from scoring once more. On Sept. 12 the Cosumnes River College Hawks managed to break a losing streak of two games as they took on the Evergreen Valley College Hawks. Having tied two and lost two in their first four games, the CRC Hawks came into the game looking for a win. EVC took the early lead scoring the first goal, but sophomore forward Jena Mamola answered back by scoring the first two goals for CRC. EVC wasn’t able to regain the lead as freshman forward Kelsey Jantzen and freshman defender Erica Lim finished off the first half by bringing the CRC Hawks their final two goals of the game. As temperatures reached over 100 degrees and exhaustion became clear in the players, CRC freshman forward Nicole Sanchez being escorted off the field after collapsing, EVC managed to score two more goals in the second half bringing the final score to 4-3 in CRC’s favor. While the CRC Hawks won the game, their dominating lead in the first half came to an end in the second and they came close to earning another tie as the EVC Hawks were one goal away from doing so. The CRC Hawks next take on Canyons College as they begin a three game road trip on Sept. 18, returning to their home field against Santa Rosa on Sept. 26.